Welcome to the second day of Cookie Bookie Week. There's a lot going on today-Cookie Bookie and my Tuesday weekly baking club. So let's proceed in order, shall we? 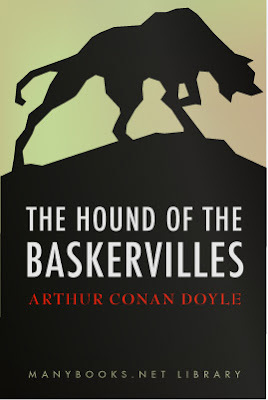 Today's book is The Hound of the Baskervilles, by Sir Arthur Conan Doyle. Did I ever mention how much I adore Sherlock Holmes? I bought the Quiet Man the complete set of Sherlock Holmes for Christmas last year. I also begged my little West to dress as Sherlock Holmes for Halloween; Indiana Jones won out, but West says maybe next year. I'm dying to sew this costume. Maybe I should dress up as Sherl-y Holmes. But the charges do love Sherlock Holmes, thanks to the old radio program cassettes that we regularly check out from our local library. I thought since they were already enamored with the brilliant old gum-shoe, that I ought to read them The Hound of the Baskervilles out loud at bedtime. The first night, I started in with Holmes and Watson considering the reported case of a phantom creature, prowling the grounds of an estate and causing general mayhem and particular murder. These are not good bedtime topics for young charges; even young charges who like Sherlock Holmes will become reticent. Especially if the wind wails outside the window and clatters the blinds. It is my experience that one night of The Hound of the Baskervilles is all that little children will be able to manage. I had to go on alone. It was better that way, because the book becomes truly spooky, suspenseful, even thrilling. But don't take my word for it; find out for yourself. And now for our cookie, or rather first things first. Today is Tuesdays with Dorie, my weekly baking club. Not to miss out on my assignment, I baked some superlative allspice crumb muffins. They were scrumptious. Please click here for the recipe. But today is NOT muffin-bookie week. That sounds almost obscene. Today is cookie bookie, and I've created an allspice-snap, cousin to the more popular ginger-snap. I have to wonder why I have been ignoring allspice all of these years. It's only been a part-of-the-gang kind of spice, not something I was willing to use on its own. But after I tried the muffins above, I knew I had to give allspice a starring role in a cookie. So ta-da. Here it is. So get reading and baking. Preheat oven to 350 degrees. In a medium bowl, combine butter and both sugars until light and fluffy. Stir in egg yolk. Add allspice, salt, soda, and flour. Form cookie dough into one inch bowls. In a small bowl combine 1/4 cup sugar and 1/8 teaspoon allspice. Roll cookies in sugar mixture. Place on cookie sheet and flatten slightly with hand. Bake at 350 degrees6-8 minutes, or until puffed in the center and crinkled on the edges. Favorite spooky book = 'The Shining' by Stephen King. Not too into the spooky books! About as far as I go is Stephenie Meyer or Harry Potter! Hoping I am still entered into the contest! I'm rather a wimp. I do not like spooky books, but I do love the Bunnicula series. Scary and fun kids books. We don't really do scary so I would have to say Where the Wild Things Are! I heart Sherlock Holms too. You don't have to enter me in the contest..I come here for the Great reading and food!hahaa...Thanks once again for another winner! I can't do too spooky but I do love all the Harry Potter books! I love that you are doing cookie bookie week. I really haven't read alot of spooky books lately. I am reading the Twilight series right now but that's not really spooky. I did love the Jaws book growing up. It's more of a thriller than spooky but close enough. Your cookies look great also. I love fall baking. Don't watch scary movies, can't read scary books-I'm a weenie. I can't handle very spooky books - I still have creepy memories of Poe's "Tell Tale Heart" from high school. I did read "Frankenstein" once and it was actually very sad, not scary. Thanks for the great giveaway! The cookies look great. I think I have some allspice somewhere. I just read Stephanie Meyer's The Host. I lived it and found it to be a little spooky-but with love stories mixed in! Right up my alley! Your blog is linked to my Tickling Shadows Blog. Hunger Games by Suzanne Collins. Because several friends on goodreads have recommended it, I put it on hold at the library only to be told I'm #39 in line. So, I ordered it from my 3rd grader's scholastic book order. Too bad it didn't come with some sort of warning, "This is a violent, murderous book." I'm 1/2 way finished, but both boys, ages 8, 12have already read it. They were disturbed, but couldn't put it down. I'm having the same problem. I don't love spooky books either. But my kids like "The Little Old Lady Who Wasn't Afraid of Anything." That's about as spooky as we get. I read the Devil in the White City.... probably the spookiest book yet! Totally interesting too, by the way. We love that book too. We put on a little play based on the book every year for our Family Night. I agree with the person that said Dracula. I guess I'm easily spooked and an old classic is all it takes for me! I guess it's not considered a spooky book, but I read Jaws before I saw the movie. I still won't go in the ocean, or even on a boat in the ocean!!! Scariest book I've read, "It". The movie terrifies me also! I really do love Cookie Bookie week. The cookies look delicious and I feel like heading off to the Library to get both of your book choices right now. My favorite chilling book is one of your choices from last year's Cookie Bookie week- Women in White by Wilkie Collins. I love this book. It’s one of my all-time favorites. I also like Moonstone by Wilkie Collins, The Mystery of Edwin Drood by Charles Dickens, and The Historian by Elizabeth Kostova. I can't wait to read your picks Prudy! Not into spooky anything, (long story), But my newest ALL time favorite is "The Christmas Sweater". It makes a grown person cry. Linked back....Hope I did it right. Stephen King always gets me - Pet Cemetery is a good one for some chills! Edgar Allan Poe's The Tell-tale Heart or The Raven...spooky! 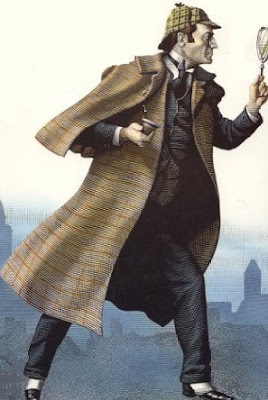 I need to check out some Sherlock Holmes books this month! I dont do spooky/scary books, truth be told When I was younger I couldnt even read goosebumps books. lol Your cookies look and sound really good though. We love, love, love Sherlock around here. I wanted to name one of the dogs Sherlock and my husband would not have any of it! He said that there is only ONE Sherlock! Your muffins look wonderful...where are you all finding these wonderful muffin/cupcake wrappers?? I am not shopping enough obviously. So cute. The cookies look fantastic. Do I dare? I think I would be tempted to eat more than one, but I might just have to throw caution to the wind. Thanks for baking with me this week. How is your homeschooling year going? I miss it so much! Looking forward to your choice for next week! Your cookie looks delicious! And I'm making a list of books to check out at the library, tommorow, based on your cookie bookie week suggestions. My favorite spooky book is definitely The Woman in White by Wilkie Collins. It's amazing. I also love "Who Killed Zebedee?" also by Wilkie Collins. When I was younger one of my absolute favorite books was "From the Mixed Up Files of Mrs. Basil E. Frankweiler." hehe I'm not a spooky book (or movie) person! I like mystery novels, which sometimes are murders and Edgar Allan Poe works, if those count! These allspice cookies look out of this world!! This past week has been hard as a food blogger, I've seen easily a dozen baked goodes perfect for Fall. I need to make a list and start working my way down! Currently- I read my 6 month old Halloween Jack - childrens book. he loves it because the last page opens up to Muwwhhahahah. He gets a kick out of it. I've always loved spooky books. Nancy Drew mysteries were always my favorite growing up. Now I'd say any of the Scarpetta books by Patricia Cornwell. I also like Christopher Pikes novels and Anne Rices Mayfair Witches. My family loves to watch the Sherlock Holmes series with Basil Rathbone. I have to say, they are very entertaining. Your cookies look very fall-esque. I can't wait to try 'em. Um, yeah, I don't really read spooky books. But I LOVE children's books. This one is actually a little spooky. It's called The Aminal by Lorna Dalian. CUTEST illustrations as a little boy finds "an aminal" while he's eating a picnic lunch and he takes it home in a paper bag. All the friends he passes by and tells about it imagine a different kind of creature. You have to see the photos! I won't spoil the end. LOVE this book! I don't know if this is my favorite, but I just finished "The Graveyard Book" and it fit the bill for Halloween season reading. Say the word free or contest, and look at how many comments you get! You're up to 40, and I'm sure there will be more. I read The Hound of The Baskervilles for Book Club a few years ago. I love Sherlock Holmes, too, and I also love Sherlock Hemlock. I agree with Catherine that The Woman in White is a very, scary read. But the scariest, I think, is the chapter about "The Lonely One" from Ray Bradbury's, Dandelion Wine. I read it late at night when the house was silent, alone in my room. It is one of the most memorable stories, I've read, and even scarier is that it's true. It really did scare me. But, then again, I don't read very many scary stories, nor do I see scary movies. They scare me. And, well, I'm a big chicken. My favorite spooky reading is Roald Dahl's short stories for adults! Huge Sherlock fan, and at one point I think I had read every Agatha Christie there ever was... Like PD James as well - I don't know if these are really spooky, per se, but they are mysterious! Current favorite mystery writer is Alexander McCall Smith, with the No. 1 Ladies' Detective Agency - not even close to spooky or even mysterious, really, but truly DELIGHTFUL! Holy smokes those muffins and cookies look amazing! The scariest book for me was Silence of the Lambs. I had trouble sleeping for days. I put a link on my blog -- whatisonyourmenu.blogspot.com about your giveaway and yummy recipes. Those cookies look delicious! No spooky books here. I am too much of a scaredy cat. Even though I really love to read, it has been all about the childrens books at my house. "If I built a car..." is one my boys love. The scariest book I hav ever read is Fablehaven. It was really spooky! Thanks Aunt Prudy! The Woman in White, by Wilkie Collins is my favorite spooky book. It has a great mix of spooky intrigue, mystery, anxiety, and English "period details" that make it hard to put down. I definitely don't do scary. I can't even watch the news or I'll have nightmares. I do love Rebecca by Daphne DuMaurier though and that has an eerie vibe. Does that count? I'm back and I still don't do spooky books but I did post a link on my blog so that I could play twice. Can't wait to see tomorrow's cookie. You are killing me this week. Cookies and books are two of my very favorite things! Does the Inferno section of The Divine Comedy count? The cookies are such a great idea! I really a good clean classic FUN-SPOOKY book. Sadly I have read a few books that are too frightening like 'In Cold Blood' and 'Excutioner's Song'...more disturbing than fun--curses on high school 'lit'. But for FUN spooky my favorite is 'Woman in White' by Wilkie Collins that you featured last year. I read it every October (better get crackin')! I also like Rebecca, To Kill a Mockingbird, Sherlocks, and even the Bronte sisters give me a spooky thrill. ps...I have a crush on Cookie Bookie week. How about Go Away Big Green Monster? Kids spooky is spooky enough for me. I vote for Jane Austin this week for a favorite. Shadow Divers. Its a nonfiction book about deep sea shipwreck diving. I never knew a book like this could make me want to leave the lights on! I don't read many scary books but the one that I found quite dark and spooky was Frankenstein. I had to read the book for my English lit class while on a study abroad program! I love the Hollows series by Kim Harrison. My all time favorite spooky book has got to be Dracula by Bram Stoker. I try to read it every Halloween. Ummm. About the Spooky-est I get is... There Was an Old Lady Who Swallowed a Bat. (My kids favorite) Love it!! Like the rest, I don't like scary! I'll take happy any day. :) If I'm feeling bold, I like Lee Child/Jack Reacher books. The last spooky book I read was The Historian by Elizabeth Kostova. It's a retelling of the story of Dracula. Suspensful, with lots of historiacal information about Europe woven through the story. Love the idea of allspice for a fall cookie. Thanks! Oh, my goodness those allspice cookies look delicious!! I'm currently reading The Graveyard Book by Neil Gaiman. Halloween-y for sure. Thanks for the giveaway! I'm a big wimp -- my favorite book is A Tree Grows in Brooklyn. If I have to pick a scary one I'd say The Stand by Stephen King. Well, I wouldn't call them spooky at all, but I like Agatha Christy books. Old, but classic. The Twilight Series is as spooky as I get. Wuthering Heights is spooky enough for me. Love your different cookies! I am making your Juicy Pot Roast for dinner tonight. Pretty excited!!! I'm kind of a whip and don't like the scary.... But I remember reading Poe back in High School. He would be my favorite in the scary sense. The cookies are a great idea, but where's the chocolate?? Many thanks for a delightful contest. The book that had me turn on all the lights in the house and not want to go anywhere at night is Thunderhead by Douglas Preston and Lincoln Child. One word: Skinwalkers. Blogged about you and linked back. By the way, you are my official guide to what to cook for dinner, or anything else for that matter. Thank you so much for posting all your delicious recipes! hmm, a favorite spooky book? they're not really my thing, but i do love harry potter. and i'd love to win the gift certificate. I had nightmares while reading the first Harry Potter book. Yeah...I'm a wimp! There was a book I read in grade school called "Wait Till Helen Comes" and that still gives me goose bumps and it's been years since I read it. I don't usually read scary books, but I love The Raven by Edgar Allen Poe. And I LOVE LOVE LOVE this week's posts. What a great blog! I have been craving cookies all week! My favorite "spooky" book is Frankenstein...love it. Go Away, Big Green Monster is about as scary I get! I really can't do spooky, but this year my 2 year old loves "Ten Timid Ghosts." I have read it 50 times at least. She even went to bed with it!